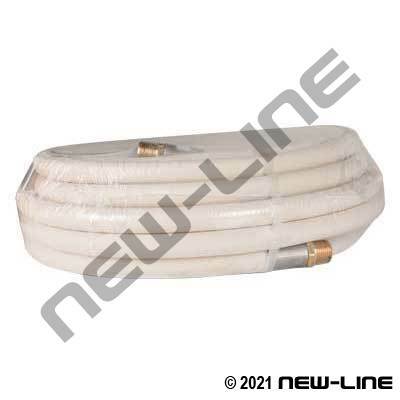 All "white" washdown hoses are not built the same. Sani-Wash Plus® washdown has a smooth, non-marking cover that is resistant to oil, grease, animal fats, and abrasion (not for use with air). Oily products cause standard EPDM hoses to swell and eventually fail. This hose is recommended for hot or cold water washdown in food processing plants, dairies, packing houses, bottling plants, breweries, and canneries. It is a flexible, kink resistant, user-friendly hose that can be cleaned easily and is available on long length reels. The tube is NOT designed to transfer food products. SPECIAL NOTE: this hose is made of nitrile rubber compounds (tube and cover) that may not be suitable for use with certain cleaning chemicals, solvents, detergents or sanitizers; such solutions can have an adverse affect on the hose, resulting in reduced service life or failure. Ensure compatibility by referring to the manufacturer chemical resistance chart. Inspect hose before each use. Construction: Tube: Smooth, black synthetic nitrile rubber. Cover: Smooth, white Chemivic synthetic nitrile/vinyl rubber blend. Reinforcement: Spiral synthetic cords.